Young people are not only our heirs to the planet and the challenges we leave behind, they are influencers and activists of today. They have the power and the will to make a difference now. Sea Otter Savvy is bringing our message of awareness, appreciation, and respect for sea otters to the youth of the central California coastal counties. 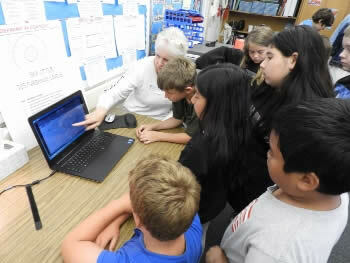 Our Sea Otter Savvy in the Classroom program currently offers visits to grades 3, 4, and 5 classrooms in San Luis Obispo county, and we are seeking “test” 3rd and 4th grade classes for the preliminary startup of our Monterey county school program. Our classroom program is designed to follow California state curriculum requirements for science for 1st through 6th grades. 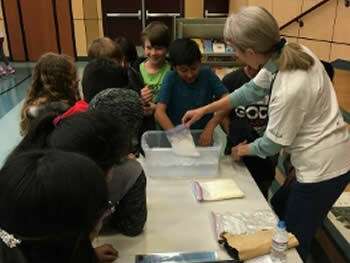 Led by Sea Otter Savvy volunteers and staff, the 45-minute program is designed to engage students in the learning process with activities, hands-on displays, and thought-provoking discussion. How much time each day do sea otters have to sleep? Sea otters help maintain healthy kelp forests. How do scientists study the effect of people on sea otter behavior? Try on a blubber layer! Students get to feel for themselves how not having a protective layer of blubber makes sea otters more vulnerable to cold. Click Read More to learn how to do the blubber activity yourself! Be a sea otter spotter! Watch step by step as a group of kayakers approach and disturb a raft of sea otters. Students become sea otter scientists as they watch and discuss real video and learn to recognize the signs of disturbance. 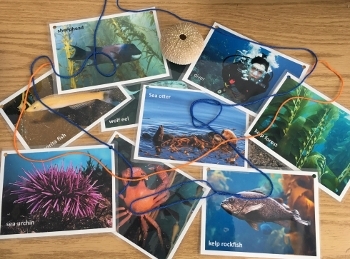 The kelp connection activity links sea otters, kelp, sea urchins, and other members of the kelp forest community. 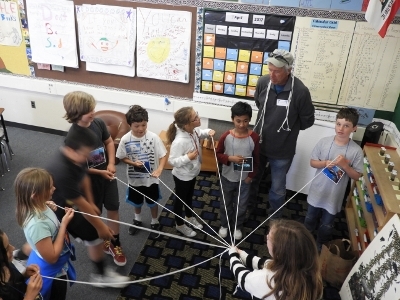 Students act as members of the kelp forest community web of life and actively demonstrate the important place sea otters hold in keeping that web together. We also offer an eelgrass connection version of this activity. What activities do sea otters have to do every day to survive? How do sea otters help kelp forests? Is that important? Is it important for biologists to study sea otters? What can students do to keep sea otters from being disturbed? 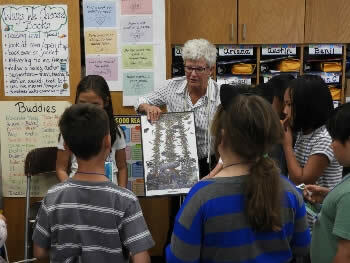 Read this article about our visit to a Palo Alto first grade class! If you are a teacher and would like to arrange for Sea Otter Savvy to visit to your classroom, please fill out and submit the online form below. Check out this list of vocabulary words to help your class get sea otter savvy before our visit. We need volunteers! If you are interested in fostering wildlife stewardship in young people, have some teaching experience, and have time to volunteer at least once a month, we need you! Please visit our volunteers page and fill out our application.